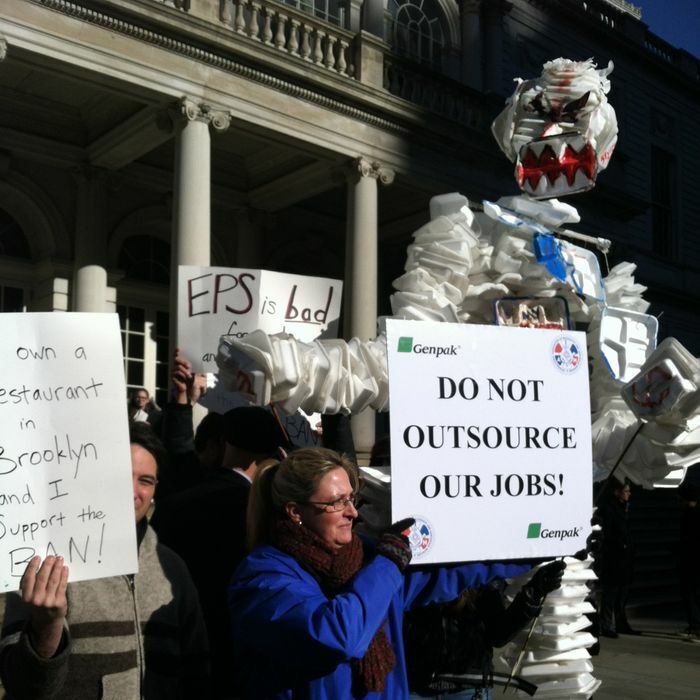 Today’s rally at City Hall in support of Mayor Bloomberg’s last-ditch attempt to ban Styrofoam — er, polystyrene — cups and takeout containers was a colorful scene: Green activists and councilmen, flanked by a legion of fifth-graders, were chanting about the evils of the space-age material. It clogs waterways, chokes sea creatures, and eats up landfill space, the argument goes. Also, it may or not cause cancer in workers who manufacture it. A dystopic future in which New Yorkers continue to consume food and hot beverages from polystyrene was symbolized by two awkward humanoid sculptures made out of dozens of takeout trays, some smeared with old food scraps. Immediately following the rally, the City Council held a hearing about two proposals on the subject. The Bloomberg-backed plan would ban foam from the food services industry almost entirely. A gentler one would start a pilot program for recycling Styrofoam. Brooklyn Councilman Lewis Fidler, a co-sponsor of the ban, framed the debate in apocalyptic terms, suggesting that without corrective actions like this law all that might be left of human civilization someday is cockroaches and polystyrene trash. Public Advocate-elect Letitia James emphasized that the softer measure was a reasonable compromise: Give a year to those in the industry to demonstrate that polystyrene can be recycled, she urged.